I was rummaging around the basement yesterday. One of the things I went looking through was my box of homemade liqueurs that made the journey home with us. It was quite a “blast from the past” – pulling out liqueurs from over a year ago. Banana, coffee, chestnut, firestarter... I’ve made quite a few over the past few years. In excess of 30 I believe, but I haven’t counted. One that caught my eye was a bottle of Desert Rose tequila. I remembered that as being very good... I stuck it under my nose it. It still is! The botanicals, after being strained out. It made me think (only wistfully so far) of spring. Soon we’ll all be in t-shirts and sweaters having drinks with friends on decks and patios. So...perhaps a refresher course on this useful liqueur. It makes for unmistakable mixed drinks. I admit, tequila is an acquired taste. I didn’t like it either. 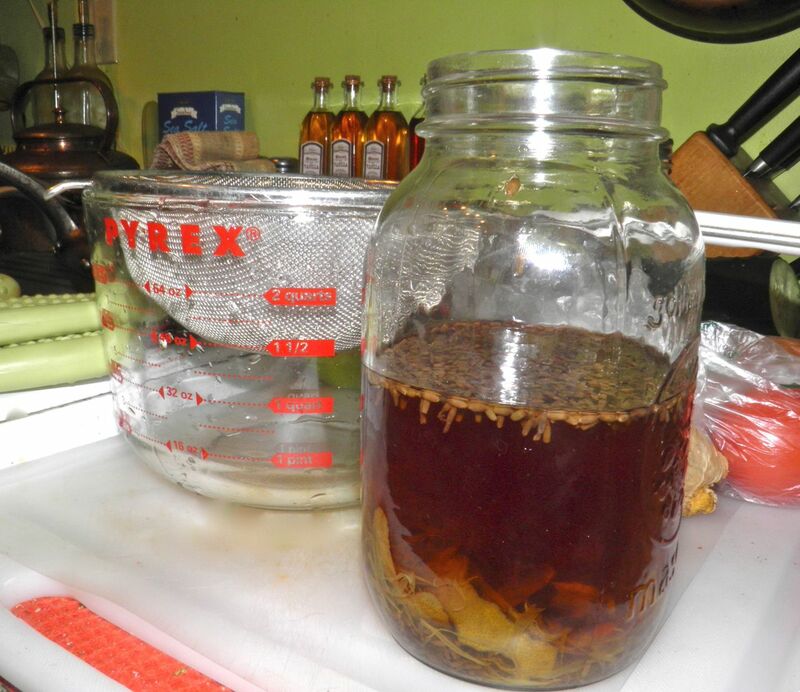 But a recipe for a mixed drink I posted for my lavender liqueur (HERE) changed my mind. It was for a drink that used lavender liqueur, lime and tequila. That cocktail recipe was called a Desert Flower. Boy was it good. Dangerous, but good. So I began to think. If people don’t like the taste of tequila why not change it. That always seems to be the problem. This liqueur recipe takes regular tequila (not even the expensive stuff) and infuses it with floral and citrus notes to make something new. I call it Desert Rose. This takes 3 weeks, but that’s not too long. Many infusions take longer. To counter some of the pucker-power of the tequila I also added some sugar and water. This wasn’t the same amount as regular liqueurs that I post, so this still has a lot of alcohol content. I’m not sure how much but I imagine somewhere around 30%. I also “fortified” it with a small bottle of dark rum. The caramel flavours also help to mellow the “piney” taste of the tequila. So treat this with respect. I started with 375 ml of tequila. That was a mistake. I would suggest that you double the recipe and use 750 ml of tequila. That way you’ll have 1.5 L on hand to share when guests rave about your concoction! I suggest serving it with soda and a limoncello or a similar citrus-based liqueur. Recipe for that is at the bottom. I had made a quickie Límon liqueur that I posted previously. That link is HERE. Here oh where is spring? Place the tequila in a Mason jar. Add lavender blossoms, calendula and lime rind. Let steep for 3 weeks. 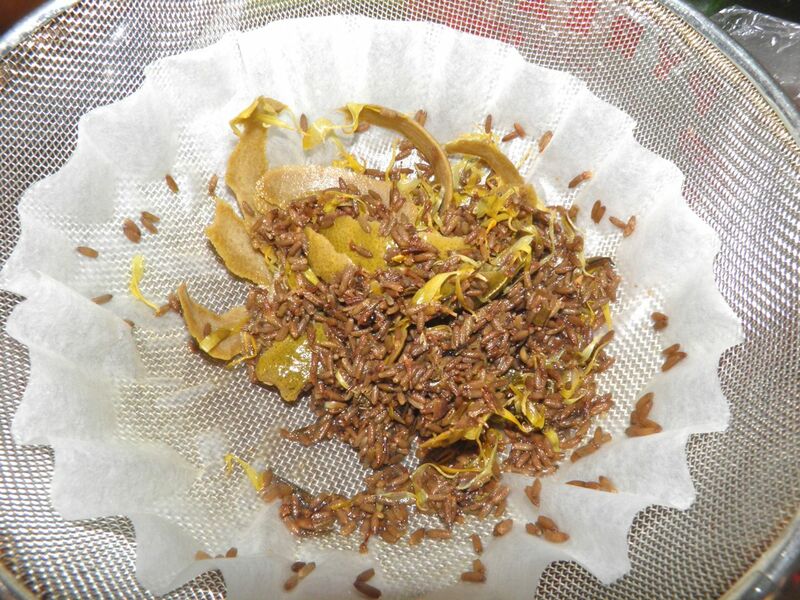 Strain through a moistened coffee filter in a sieve, reserving the botanicals. Make a syrup from the sugar, water and reserved botanicals. Bring to a boil and let simmer for 3 minutes. 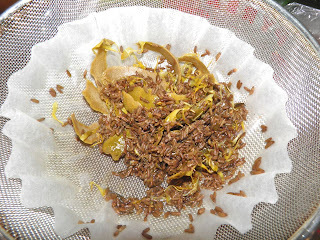 Strain the syrup through a coffee filter. 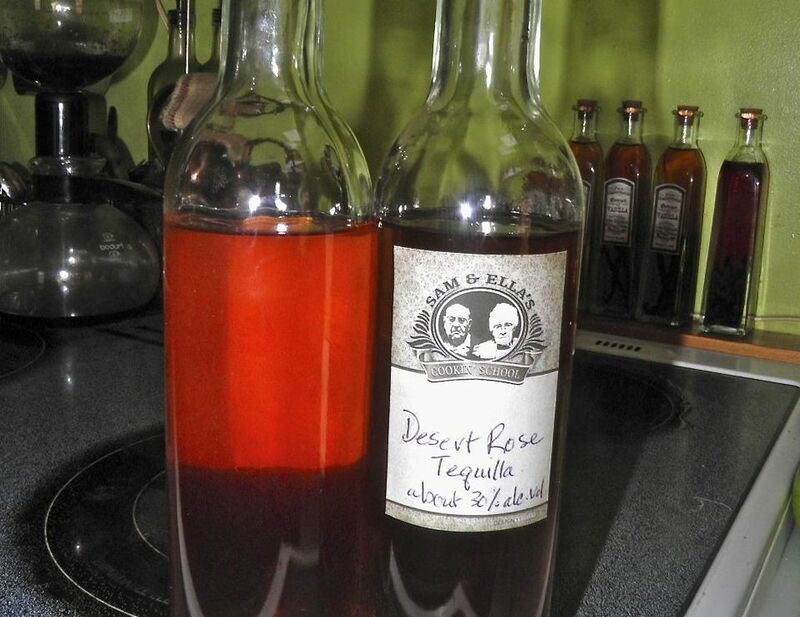 Combine the syrup, infused tequila and rum and bottle. This will be better if allowed to age a further month. Fill an Old-Fashioned glass (one of the short ones...) with ice.